Worthing Raiders Rugby Club head coach Jody Levett admits his side’s current form is a cause for concern. Raiders fell to a seventh successive National 2 South defeat on Saturday when they went down 53-18 at Cinderford. After three wins from their opening four games, an alarming run has seen them collect just two victories from 14 league matches and has left them second from bottom. Raiders are five points adrift of fourth-from-bottom London Wild Geese and safety and Levett wants to see a turnaround in form sooner rather than later. He said: “I’d be silly to say that this run we are on is not concerning. We sat down as a squad last Tuesday and looked at what was needed for us to turn things around. “We’ve been unfortunate with injuries so far this season but at times we’ve not been good enough. “In several games we’ve been leading but have then failed to make the most of our dominance. I think we’ve led in six games at half-time this season but then failed to go on and record a victory. If Raiders are to get themselves out of trouble they will have to do it the hard way with some tough fixtures coming up. 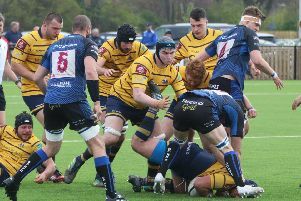 They welcome second-placed Old Elthamians to Roundstone Lane on Saturday, before meeting another two of the top six in the following three matches. Despite the tricky run, Levett believes Raiders have more than enough to pick up some positive results in their upcoming matches. He said: “We are aware of what a tricky run we face but everyone is full of confidence going into the Old Elthamians clash. “They’ve got some great quality but we’re at home and will be looking to get back to winning ways. Raiders had 25 players who have featured for the first team this season unavailable for the trip to Cinderford. Although the injury list is continuing to grow, Levett felt he saw some positive signs and a reaction following the home defeat to Bury. He said: “I saw a reaction at Cinderford from the players and it’s something positive to take moving forward.